Listed among the Outstanding Academic Titles for 2013 by Choice, a publication of the Association of College and Research Libraries. Focusing on gardeners’ words about the art of gardening, Writing the Garden: A Literary Conversation Across Two Centuries by landscape historian Elizabeth Barlow Rogers, brings together a diverse array of authors. 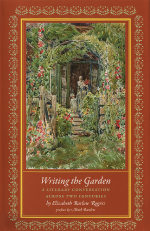 For the most part they are not professional landscape designers or how-to horticulturists but rather hands-on gardeners who write with their own gardens in full view. Ranging in time and place from Enlightenment France to modern-day New York City, they invite the reader into the natural world of soil and flowers, insects and sun, pride and frustration. Jean-Jacques Rousseau, Thomas Jefferson, Henry David Thoreau, Gertrude Jekyll, Andrew Jackson Downing, Celia Thaxter, Vita Sackville-West, Russell Page, Rosemary Verey, Hugh Johnson, Paula Deitz, Lynden Miller, and Michael Pollan are among the fifty writers whose works are excerpted and discussed. To purchase, visit your independent bookstore or click here.